Drake Bay and the Osa Peninsula is one of the most unique fishing destinations in the world. We are located near several river mouths and the famous Caño Island is just 12 miles from our home port. Over 40 International Game Fish Association (IGFA) records have been set within 80 nautical miles of Drake Bay. The island has a massive reef system that provides great bottom fishing and trolling opportunities. Our offshore fishing is usually 15-25 miles from shore but with the range of the Reel Escape, we go to where the fish are, even if that means over 25 miles. Thankfully the waters around Drake Bay are usually calm with a light chop which provides a pleasant ride. Because of the variety of waters, we are able to customize each trip based on the type of fishing and species desired. We cast top water poppers, jig the bottom for big Cubera Snappers and Grouper and fish with live bait for Roosterfish. Offshore we troll for big pelagic fish including Blue, Black and Striped Marlin, Pacific Sailfish, Mahi-Mahi, Yellow Fin, Wahoo and Big Eye Tuna. At the client’s request, we can also fly fish for these species. Since we are on the water virtually every day we know what’s biting and where. Fishing also depends on the season, the moon phase and the tide schedule. Captain Willy factors all of this into consideration when deciding where to go and what to target. As a general rule of thumb, the best time to catch Sailfish is between January through April. Marlin/Mahi-Mahi/Wahoo are generally better May through September. Tuna, Roosterfish, Grouper, Snapper, Mackerel and other bottom fish are here year round. However, fishing is fishing and you never know what you may catch regardless of the time of year. One of the most exciting sport fishing charters we do is to look for the huge schools of tuna that often swim offshore. Experienced anglers can cast big poppers and top water lures to these hard fighting beauties and often times the tuna will hit the bait so hard it almost takes the rod out of your hand. This is a heart pounding adventure that every angler needs to experience. We also specialize in catching huge Roosterfish. We regularly catch and release fish over 50 lbs. Our clients have caught Roosterfish nearly 100 lbs, close to the world record. Most fish we catch are caught on medium weight spinning rods providing an outstanding fight. 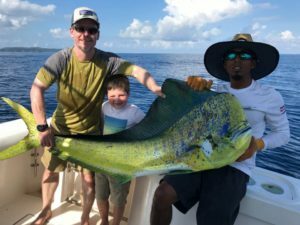 At Fish Drake Bay we do not just offer your basic fishing trip, our Captain and mates will work tirelessly to make sure our clients have a great day on the water. We encourage you to read our numerous Trip Advisor reviews from our happy clients from around the world. We look forward to fishing with you!